HOME. One thing I’ll never, ever get tired of is waking up to this view. Watching the sun slowly rise over the sky high buildings in the morning is pure magic. The gorgeous bedding was an early Christmas present that arrived the other day and let’s just say I don’t plan on getting out of bed at all today, so cozy! P.S. For more inspiration, check out my Pinterest. This entry was posted in Interior design and tagged bedroom, Home, interior by Carolina Engman. Bookmark the permalink. 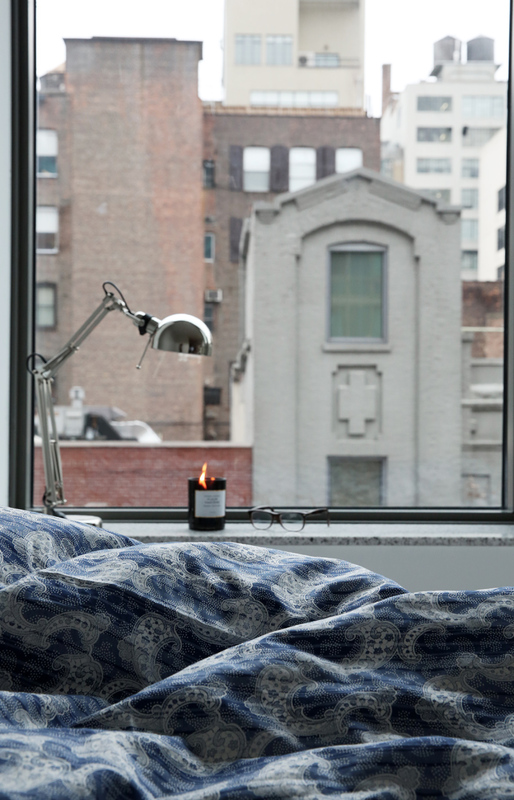 Such a cozy photo :) Love your bed linens! guess i wouldnt get out of my bed either if i had such a beautiful view from it!! your nyc apartment seems amazing. looks so cozy!! love it! Lovely photo!♥ the view is so beautiful! If you did stayed in bed all day, I totally understand! I love this picture. Interior design really is a guilty pleasure. Gorgeous bedding and view. Enjoy having a lazy day…sometimes those are the best! new york is the best city of the world!!!!!!!! oh nice bed.. good night! Love the big windows you’ve got in your appartment. The view is breathtaking, love your bedding! Looks so cozy and inviting! What a wonderful view. I have similar printed bedsheets. Your view is amazing! I think the view to a home can be the best part. I’ll have to check out your Pinterest now! qualiiity picture! New post! BLOG.THE.DREAMS.COM …. Join my GIVEAWAY! You can choose the item you want!! BLOG.THE.DREAMS.COM !